The first several weeks of the newborn’s life is going to be the most sleepless you will ever be. That is why experts recommend co-sleeping so that parents can get some rest. Although such has excellent benefits for both the baby and parents, there are also some dangers, so following guidelines given by the manufacturer is vital to ensure safety. One of them is to make sure that both parents are aware that there is a baby with them in the bed. They also need to ensure that the baby is not sleeping with other siblings. It is crucial as well to never co-sleep if the parents are smoking, intoxicated or taking drugs. Likewise, they should also never let the baby sleep on a pillow. Another thing is to let the baby sleep in a co-sleeper or a bassinet as opposed to making the baby sleep on the bed itself. This prevents the baby from accidentally getting rolled over by any of the parents especially when both or any of them are deep sleepers. 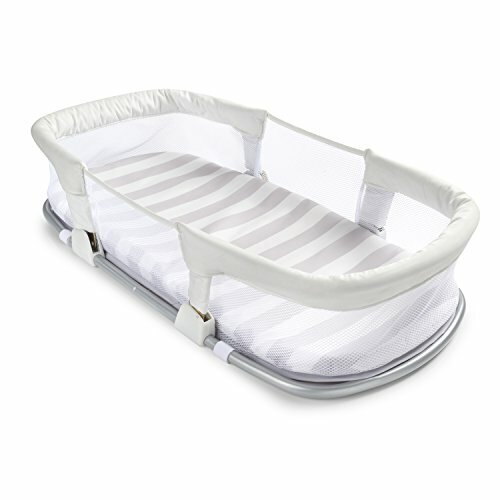 This leads us to the SwaddleMe By Your Side Sleeper, a bassinet that is designed to make co-sleeping safe. Its metal frames are collapsible for easy storage and travel. It has a neutral color. This co-sleeper is easy to assemble. It can be converted to a diaper changing station when the baby outgrows it. The metal frames are padded. It can only be used by your baby for a short time. It does not come with a travel bag. You cannot breastfeed while the baby is in the co-sleeper. It is not JPMA certified. It takes a lot of space even on a queen-sized bed. It has a strong chemical odor, so it should be washed or wiped before your baby uses it. It only comes with one fitted sheet. The bottom does not have any support. The SwaddleMe By Your Side Sleeper is the perfect product for safe co-sleeping since it allows you to monitor your baby, which is owed to the mesh material used on its side. Likewise, this provides good air circulation to prevent suffocation. It is also made of soft and hypoallergenic materials to keep your baby comfortable while sleeping or during other activities. In addition, it comes with a mattress and a fitted sheet that can be machine washed for easy and fast cleaning. Moreover, the sleeper pad and frame can be wiped clean with a wet cloth. This co-sleeper has a sturdy frame which prevents baby from falling, and since it is collapsible, you can store it without hassles when not in use. It is also compact enough, making it effortless for you to bring it when you are traveling with your baby. The color and design are neutral, so it is perfect for baby boys and girls alike. For your baby’s safety, this co-sleeper should not be put in a crib because it is only designed to be placed on top of a bed. Also, it is not recommended to use other comforters or sheets besides the one provided or manufactured by SwaddleMe. Additionally, the baby should no longer use it once he or she can roll over or push his or her body up, which is usually from birth until three months. Just like the SwaddleMe By Your Side Sleeper, the Baby Delight Snuggle Nest is also a perfect lightweight product for co-sleeping. It also has mesh sides for good air circulation and is foldable for easy storage and packing for travel. Both of these co-sleepers are also washable to ensure germ-free usage. In addition, the Baby Delight Snuggle Nest also comes with a mattress and a fitted sheet and is also not recommended to be used in a crib. Further, it comes in a neutral design, making it suitable for either gender. Although these two products portray a lot of similarities, they also have some notable differences. 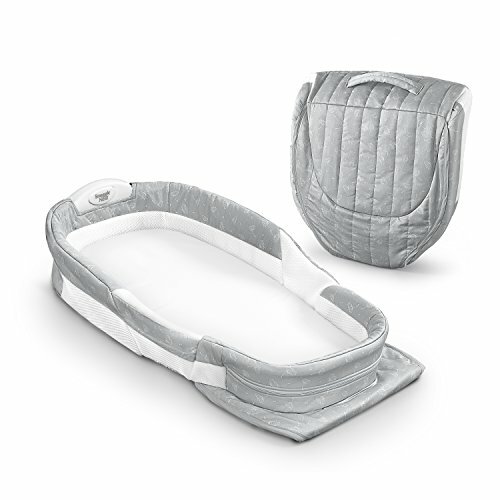 Unlike the SwaddleMe By Your Side Sleeper, the Baby Delight Snuggle Nest, when folded, turns into a bag which allows you to put a couple of your baby’s things. This co-sleeper also comes with a built-in sound and nightlight to help your baby sleep better, while, the SwaddleMe By Your Side Sleeper does not. The Baby Delight Snuggle Nest also has a quilted cover, whereas, the SwaddleMe By Your Side Sleeper’s cover is not. In spite of their differences, these two products are recommended because they will provide the security needed while your baby sleeps with you. The SwaddleMe By Your Side is an allergen-free product that is suited for babies up to three months of age. Its portability and low weight are a huge plus because you can quickly bring it when you are traveling. Cleaning it won’t be a problem either because the mattress and fitted sheet are machine-washable. Additionally, the incorporation of easy-to-wipe metal frames makes it stable. Although it can only be used for a short period, you can extend its usage by converting it into a diaper changing station. Another advantage of this product is its manufacturer has an available customer service line; if in case you will have issues with it, you can contact them for assistance. Taking those reasons into consideration, we are confident to say that the SwaddleMe By Your Side Sleeper provides the security parents need when they decide to let their baby sleep beside them.